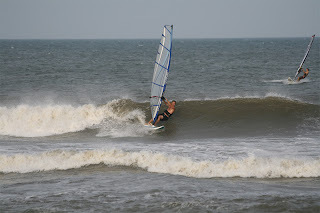 Bill's OBX Beach Life: SW on Tap All Week?! SW on Tap All Week?! 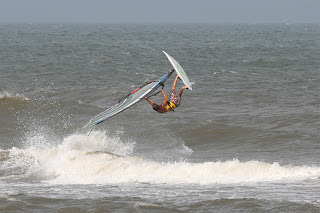 Today, again SW winds ramped up during the afternoon hours on the OBX! The forecast looks promising all week, with a strong Bermuda high fixed offshore, and IWindsurf noting continued strong SW wind though Friday! Lots of possible action on tap for the GoPro. Unfortunately, the video I had today, shot onboard Caleb's ride, did not turn out. Not sure why, but perhaps it was the new flash memory I installed. Oh well, if there is going to be wind all week, we have plenty of time to get some more footage. Conditions at the Ramp today included waist to chest high surf, and SW winds ranging from 20 to over 30 mph. I rigged 4.7m but later bumped up to the 5.3m. Winds did drop, but the surf cleaned up nicely. 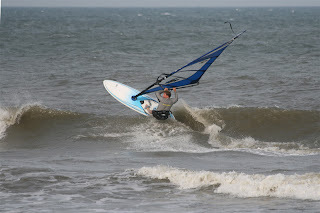 All in all, what better way to spend a Monday afternoon than in the wind and waves off the OBX! Sailors included Keith, Dan, Jim, Caleb, Billy, Charlie, Eric (on a kiteboard), and myself. There are photos, and I will post some once they come in. Caleb kicking the tail out...dig those cammo trunks! 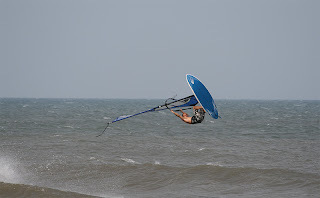 Keith mid backloop...displaying the underside of the new Exocet X Wave 93! We Need a Bermuda High! 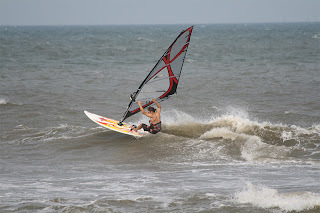 Where are the Best 2007 OBX Surf Breaks?